Xcode 4.3 was released on February 16th. It is now truly a Mac App Store application. 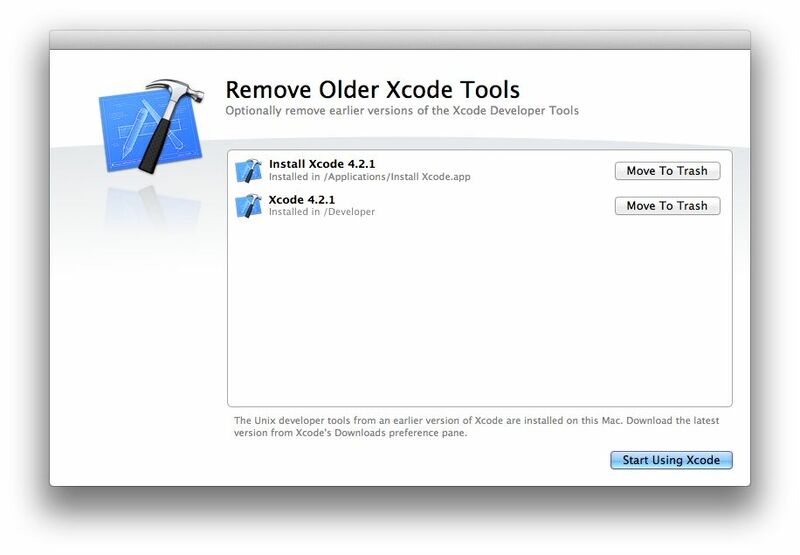 With Xcode 4.2, you downloaded an “Install Xcode” application from the Mac App Store, which in turn “installed” Xcode in the usual location, “/Developer”, which is a folder named “Developer” at the root of your hard drive. Furthermore, if you wanted Xcode to automatically update (from the Mac App Store), you had to keep the “Install Xcode” application (1.8 GB) in your Applications folder, as that was what the the Mac App Store actually updated; you then had to run “Install Xcode” manually to update. This has changed for the better. Xcode is also smaller, since a lot of (probably) lesser-used software has moved to optional downloads. Peter Hosey has a comprehensive list. This updates the command-line Xcode tools to point to the new location, and is only important if you are migrating from 4.2. A new install should work fine. Install autoconf. Some of my projects (and many unix-based ones) use autoconf to generate ‘configure’ files, and this tool is missing from the new install. It was present in earlier installs, so I have filed a radar. Update any scripts that have a hard-coded ‘/Developer’ path. Since everything is in the ‘/Applications/Xcode.app’ bundle, the new path is ‘/Applications/Xcode.app/Contents/Developer’. If you don’t want to hard-code it (for instance, if you use Xcode 4.3 but your colleagues are still on Xcode 4.2), you can use the output of xcode-select --print-path to find the path to ‘Developer’ on any system. This works in Xcode 3 as well. Xcode 4.3 requires MacOSX Lion 10.7.3.